Beginning June 3, 2013, Church Greeters 101 is available exclusively for the Kindle Format via Amazon. The church greeter ministry is a vital part of welcoming visitors to your church. Sadly, this ministry gets neglected, overlooked, or relegated to auto-pilot, ending up with begging for unmotivated volunteers who fill a space. Church Greeters 101 leads you forward in starting or relaunching the greeter ministry of your church, covering such topics: how to recruit church greeters, ways to train church greeters, and ways to cast the vision for ongoing hospitality ministry to your church visitors. Your church can’t make an impact if your visitors don’t come back. Church Greeters 101 will help you make sure your greeters are NOT the reason visitors stay away from your church. 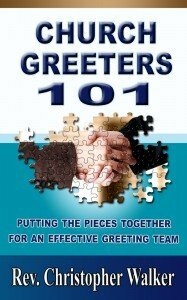 If have the responsibility to lead the your church’s greeter ministry, Church Greeters 101 will help you get started and putting an effective church greeting ministry in place. Perhaps your greeter ministry has fizzled out during an interim minister, after the previous pastor left. Maybe your church greeting ministry has been neglected because your church has been through a process of healing from a tough season. Now it’s time to re-energize your church greeter ministry. Or maybe your church has never had a greeter ministry and you feel the need to start something, or to start putting some order in place. Church Greeters 101 can help you start organizing this ministry to improve your church’s welcome experience, identify and recruit new volunteers, cast a renewed vision for hospitality ministry, and take your welcome experience to new levels. I’ve seen other church greeter ebooks for sale at $39 and at $49. For years, I have sold this book at 14.99 from this website as a digital product. It is the best seller of all products in the EvangelismCoach Store. Now that it is available exclusively for the Amazon Kindle, it’s been discounted yet further to $9.99 for the Amazon Kindle Version. You get more tested information for more than half-price of what others are selling their church greeter ebooks for. 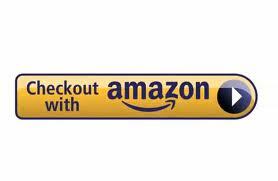 Clicking this button will take you the sales page for the version from Amazon. P. S. Let me remind you. Download It Now – Read It Tonight – Use It Tomorrow! This is an electronic book only for the Amazon Kindle. I read Kindle books on my Smartphone, and on our tablet, and on all the PCs in our home. PPS. Just so you know, I’m a real person and I really do sell these books online and give live seminars throughout the USA and Latin America. My contact information is at the bottom of this page. Note: Pricing is subject to change via special promotions and may vary from time to time.